When examining the diet of the average American, this idea is extremely frightening. Processed foods containing GMOs, chemical preservatives, chemical dyes and artificial flavors fill the aisles of supermarkets across the country. When inspecting the ingredient labels on these foods, it becomes evident that a degree in chemistry is required to fully understand what is actually contained in these so-called “foods”. The few ingredients that are recognizable as real food are generally derived from plants and animals that have been grown or raised on chemical fertilizers and/or feed containing GMOs. Although some quality organic food options do exist and purchasing them supports organic agricultural practices, the best way to obtain the healthiest and freshest food possible is to grow it yourself. Growing your own food was something that just about everyone did a few generations ago. Unfortunately, in today’s culture, most people don’t even know where to begin to grow their own organic food. Growing high quality organic food at home is not extremely difficult. In most cases, a little guidance is all it takes to understand the basics of organic horticulture and how to begin growing your own healthy food at home. 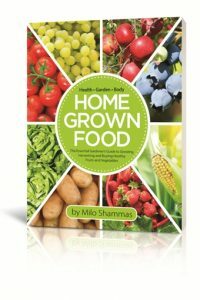 A great place to find that much needed guidance can be found in a book authored by Milo Shammas called Home Grown Food. Home Grown Food is a complete guide to understanding the composition of a living soil, organic gardening techniques, the benefits of an organic diet, and how to make an organic garden work. Essentially, Home Grown Food is an in-depth instruction manual detailing how to take control of your health through your garden and diet. What is really refreshing about this book is the straightforward way its six chapters are organized. In chapter one, the emphasis is on understanding a living soil. It makes perfect sense to have this as the first chapter because the foundation of a healthy organic garden is the soil. One of the biggest blunders of modern agriculture is treating the living soil as a substrate void of life. This has led to our ever-increasing problems with commercial applications of chemical fertilizers and pesticides which are now responsible for polluting our land, water and air. Not only does Home Grown Food illustrate the importance of building a living soil, it also breaks down the important aspects of a soil’s composition and provides helpful hints as to how to create and maintain a fertile soil. understand that eating organic food is a healthy choice, but they fail to understand what it is about organic food that is beneficial. This chapter discusses how it is the high levels of phytonutrients and antioxidants found in fresh organic food that makes it such an asset to human health. Chapter five is a general review of gardening basics. As stated in the book, gardening is a vast subject matter and there is always more to know. However, Home Grown Food does an excellent job providing the most important and relevant information for new gardeners to get growing and for experienced growers to go organic. Finally, in chapter six, Home Grown Food lists one hundred great plants to grow and eat for your health. The alphabetical list of the 100 plants is impressive, but what is really first rate is the information provided for each of the listed plants. For each plant on the list there is a description of the health benefits (including the diseases they help prevent), a vitamin and mineral profile, a “how-to-grow” explanation, insect/pest control, and any tricks or tips that may help the gardener. All-in-all, this final chapter serves as an excellent reference section for the 100 plants that can provide significant health benefits to humans. Milo Shammas and his company Dr. Earth Advanced Organics (DrEarth.com) are no strangers to success in organic horticulture. As the “Godfather” of probiotic soils, he was the first person to produce organic, prepackaged soils that were inoculated with living microorganisms. This unique approach revolutionized the organic, prepackaged soil and fertilizer markets and caused many imitators to try to follow suit. In 2004, Shammas realized that the microorganisms contained in prepackaged soils could be susceptible to damage under extreme temperature conditions. The damage usually occurs when the soil is shipped or stored in very hot or cold temperatures. To rectify this problem, Shammas patented his ProMoisture Hydrate (derived from aloe vera). He discovered that by using an extract from aloe vera’s inner fillet he could protect the living microorganisms within a prepackaged soil from extreme temperatures. This, again, revolutionized the organic, prepackaged soil industry. Simply put, if a prepackaged soil does not contain ProMoisture Hydrate, it cannot protect the microorganisms within from extremely hot or cold temperatures. ProMoisture Hydrate is just one example that demonstrates how Dr. Earth supplies the highest quality organic products without compromise. There is a reason why the company’s tagline is “the root of organic integrity”. All of Dr. Earth’s products are derived from the highest quality organic ingredients, contain absolutely no GMOs, and are certified for organic production. As previously mentioned Milo Shammas is an inventor and currently holds four patents, including the one for his ProMoisture Hydrate. He is a problem solver and loves to challenge himself to find innovative solutions to difficult issues. As the CEO of Dr. Earth, Shammas has proven himself as a business man, but it is his creative side that drives him and gives him purpose. It’s no wonder that his love of reading and writing, along with his passion for healing the earth, fueled his desire to become an author and publisher. 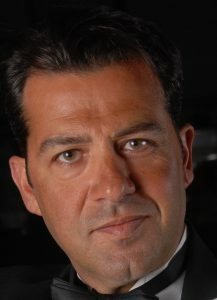 In addition to being a CEO, inventor, publisher, and author, Milo Shammas is an activist. He has consistently used his power to address real concerns that are normally outside the realm of an organic fertilizer company. The sad fact that many people around this world do not have access to clean water is a real concern for Shammas and is why he personally supports the Leonardo DiCaprio Foundation. Milo Shammas is the type of guy who takes world hunger seriously; a problem that he can, and will, help solve. Shammas doesn’t just dream big, he makes big things happen. Shammas is motivated to make the most of his unique opportunity to generate significant change in our world and he does it for the betterment of all of the earth’s inhabitants. Shammas’s new website, MiloShammas.com, will be a central hub for those interested in pursuing an organic lifestyle and/or getting involved in and learning more about his personal quests through activism. There are many great scientists, philosophers and activists who understand the importance of regaining earth’s health. The harm we have done to our planet was originally done out of ignorance, but that is no excuse to continue damaging our planet. We can no longer deny that chemical fertilizers and chemical pesticides are causing real damage to the fragile ecosystems in our environment. We can no longer ignore the fact that there are many people around the world who do not have access to food or clean water. The time for change is now. Mahatma Gandhi said, “Be the change you wish to see in the world.” One of the easiest ways to immediately make a real, significant change is to start an organic garden. 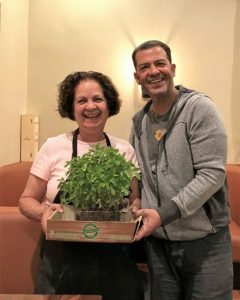 From providing yourself and your family with fresh, organic produce to gaining more knowledge about living soils, the benefits of this seemingly insignificant venture are numerous. 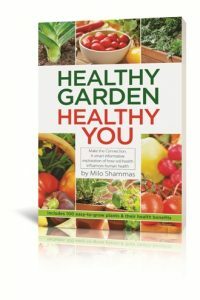 Milo Shammas’s book Home Grown Food can help gardeners of all skill levels practice organic gardening techniques and gain all of the benefits that an organic lifestyle provides. In a world where not everyone fully comprehends the significance of Hippocrates’s quote, “Let food be thy medicine and medicine be thy food”, the book Home Grown Food stands out as a beacon of truth, integrity, and real hope for our future. For more information and to order Home Grown Food or Healthy Garden Healthy You visit MiloShammas.com.